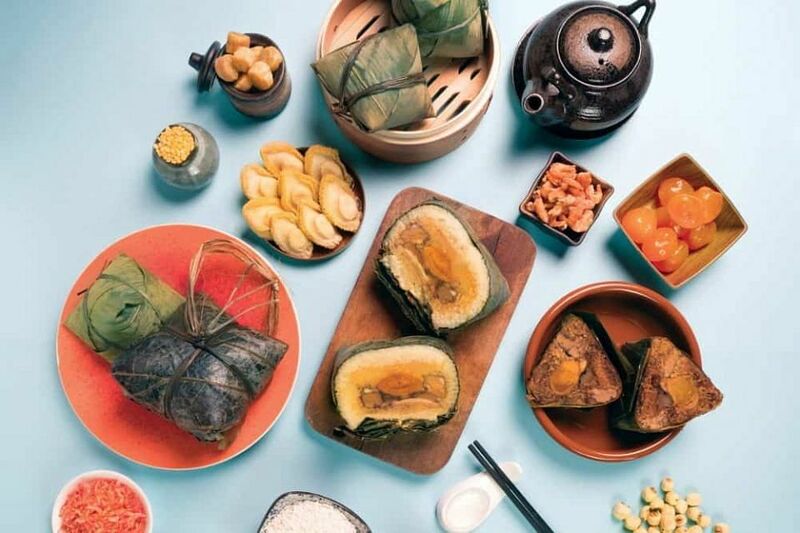 SINGAPORE (SHAPE MAGAZINE) - On June 18, celebrate Dragon Boat Festival 2018 with delicious rice dumplings. Find out where you can get your hands on some of the tastiest ones. While we love the classic roast meat and salted egg yolk rice dumplings, we cannot resist these flavourful and creative creations by Singapore’s top restaurants. We are definitely eyeing those healthy options that come with nutritious grains. Most of these dumplings are available till June 18, 2018, so be sure to get yours before the Dragon Boat Festival! The newly revamped Hua Ting Restaurant commemorates this year’s Dragon Boat Festival with a couple of perennial favourites – a savoury Hong Kong-style rice dumpling and a sweet "kee chang". The signature Hong Kong-style rice dumpling ($32.80) is shaped like a rectangular golden pillow wrapped with bamboo and lotus leaves. Its generous filling comprises whole abalone, roasted duck, roasted pork, dried scallops, mushrooms, salted egg yolk and chestnuts. Hua Ting’s classic kee chang, which comes with red bean paste ($6.80), is excellent as a dessert or even an afternoon tea treat paired with Chinese tea. Till June 18, you can enjoy these items for dine-in and takeaway. This year, Crystal Jade features two new dumplings: a "mala" rice dumpling and an assorted mushroom with pork belly dumpling. The "mala" rice dumpling ($8.80) teems with succulent pork shoulder and Spanish pork collar marinated in a proprietary "mala" blend. Sichuan peppercorns, a mix of dried chillies and chilli oil lend fiery kick to this dumpling, which is nicely balanced with sweet chestnuts, salted egg yolk and mung beans. The assorted mushroom with pork belly dumpling ($7.80) is crammed with three types of mushrooms (shitake, king oyster and white button mushrooms) alongside a mixture of pork belly, chestnuts, salted egg yolk and mung beans. Besides these, Crystal Jade also offers other varieties, such as premium rice dumpling with abalone ($19.80), packed with 10-head braised abalone, roasted pork, roasted duck, dried scallops, shitake mushoroms, chestnuts, salted egg yolk and mung bean. 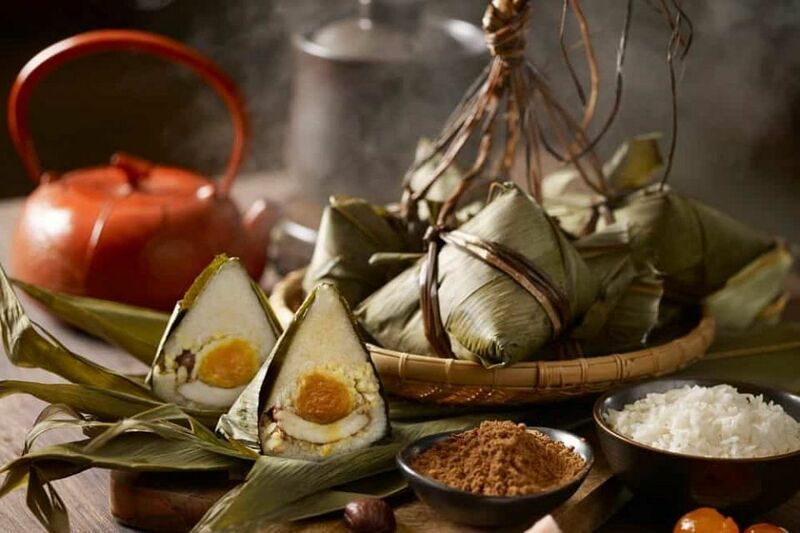 There is also the classic rice dumpling with five-spiced marinated pork ($7.80), comprising fragrant glutinous rice, juicy pork chunks, sweet chestnuts, salted egg yolk and mung beans. Available at all Crystal Jade restaurants till June 18. 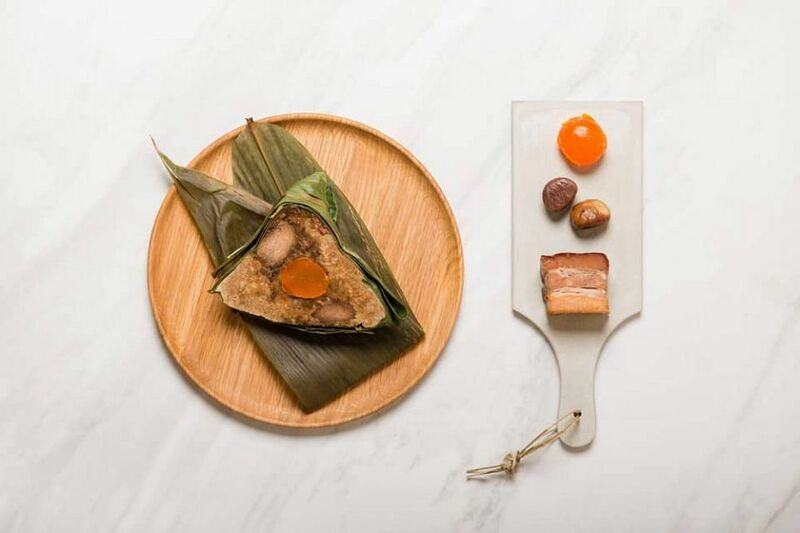 This year, one-Michelin-starred Cantonese restaurant Summer Palace introduces two new handcrafted rice dumplings: the dried oyster, sea moss and kurobuta pork dumpling ($28) and the five-grain vegetarian pumpkin dumpling ($22). 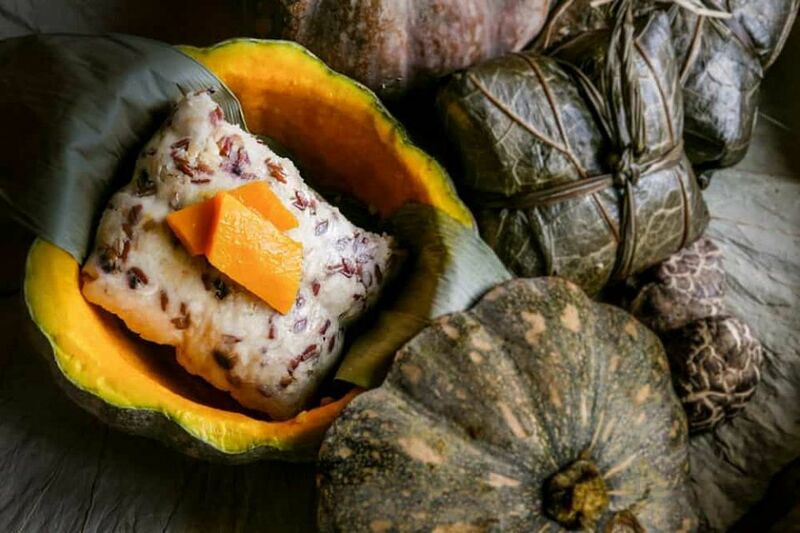 The pumpkin dumpling is a healthy rendition made with a nutritious blend of five-grain variations of oat, brown rice, pre-germinated brown rice, buckwheat and pearl barley. It is packed with quality ingredients such as pumpkin flesh, morel mushrooms, bamboo piths, sweet corn, lotus seeds and green beans. The dumpling is interestingly partnered with a housemade creamy pumpkin sauce. The chef has also created an abalone steamed rice dumpling ($38) generously stuffed with a mixture of abalone, black mushrooms, chestnuts, green beans, dried scallops, roast duck and salted egg yolk, as well as a sweet version with red bean paste and fragrant osmanthus honey ($13). Available at Summer Palace till June 18. Holiday Inn Atrium’s Xin Cuisine will roll out its best-selling rice dumpling with decadent abalone, foie gras and tea-smoked duck ($38.80) this festive period. Encased in fragrant glutinous rice is a combination of buttery foie gras and premium Australian abalone alongside the signature home-style roast duck perfumed with tea leaves. Those who prefer seafood will love the new superior fish maw and cod fish dumpling ($28.80) combined with dried scallop and salted egg yolk. Also new this year is the truffle and pork belly dumpling ($18.80), which marries pork belly, preserved Chinese sausage and aromatic truffle in one delicious bundle. If you prefer traditional flavours, there is the Xin Cuisine housemade traditional dumpling ($12.80 a dumpling, $58 for six) – a popular signature filled with braised five-spiced pork belly, mushrooms, shrimp and salted egg yolk. The dumpling with osmanthus, ginkgo nut and Chinese date paste ($10.80) is a lovely sweet option to round off the meal. All five dumplings are available at $88 till June 18. Wan Hao has created four rice dumpling treats, including the new red vinasse chicken rice dumpling ($16). Chunks of chicken thigh meat are marinated for hours with piquant red vinasse sauce, made from the fermentation of glutinous rice, red rice yeast, rice wine, sugar and salt. The filling also comes with black-eyed beans, chestnuts and a savoury egg yolk. The sweet-toothed will love the new locally inspired coconut, brown sugar, red bean and chestnut rice dumpling ($12). The dumpling is paired with palm sugar sauce for takeaway orders or served with refreshing coconut ice cream at Wan Hao Chinese Restaurant. Another new must-try option is the healthy black truffle five-grain vegetarian dumpling. In this East-meets-West creation, the black truffle adds a welcome earthy aroma to the mixture of black glutinous rice, glutinous rice and grain rice as well as turnip, carrot, king oyster mushroom, black fungus, vegetarian bak kwa and braised peanuts. 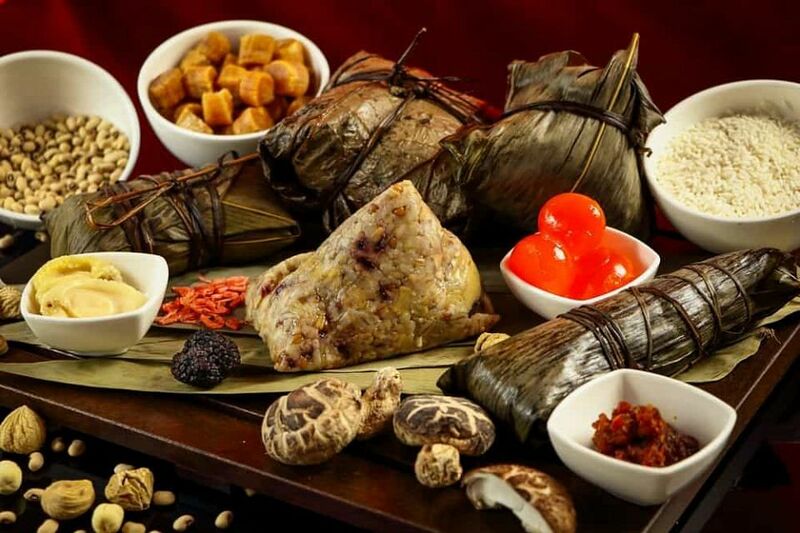 Aside from these new items, Wan Hao is offering its signature Cantonese-style pork and salted egg rice dumpling with mushrooms, black-eyed beans and chestnuts. Purchase a set of four handcrafted rice dumplings elegantly packaged in a gold premium box and enjoy 20 per cent off till June 18. The well-established Hai Tien Lo is offering new creations and perennial favourites for this year’s Dragon Boat Festival. Try the new classic pork knuckle dumpling with yam and peanut ($17.80), loaded with tender pork knuckle and mixed with braised peanuts and yam. Or munch on the unique brown rice and premium glutinous rice dumpling with salted egg and corn ($8.80). 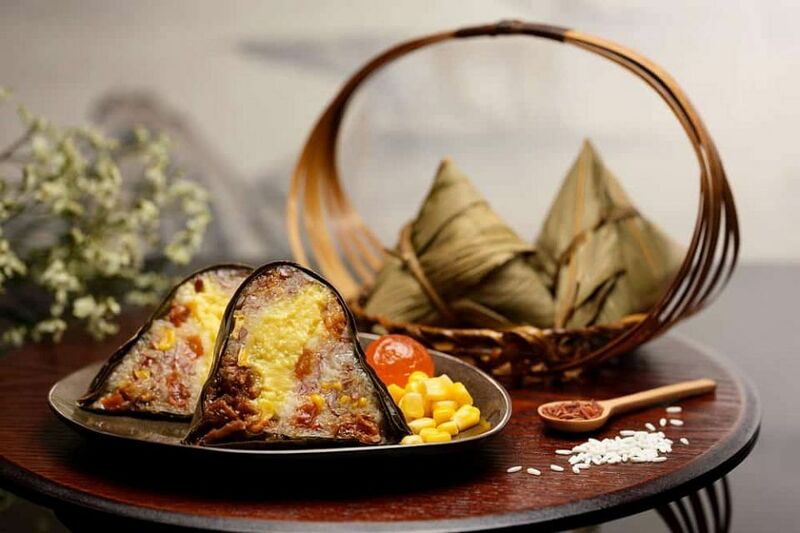 The signature traditional jumbo rice dumpling ($31.80) marries premium glutinous rice with quality ingredients such as dried scallops, Japanese mushroom, succulent pork belly, salted egg yolk. Other traditional flavours offered include the Cantonese pork dumpling with salted egg yolk ($13.80 a piece) and traditional Nyonya dumpling ($9.80 a piece). Enjoy these flavourful rice dumplings while dining at Hai Tien Lo or takeaway from the restaurant till June 18. Man Fu Yuan offers four varieties of handcrafted rice dumplings, available for takeaway and dine-in till June 18. A new highlight is the barbecued smoked char siew rice dumpling ($12.80). Wrapped in glutinous rice are sumptuous slices of Man Fu Yuan’s new signature barbecued Kagoshima pork belly char siew, which is first marinated with rose wine, then barbecued until caramelised and finished by smoking over tea leaves and wood chips. For classic flavours, the Hokkien-style rice dumpling ($9) brims with five-spice seasoned pork belly, chestnuts, and salted egg yolk. You cannot go wrong with the signature X.O. sauce Nyonya rice dumpling ($10.80), which features a generous portion of minced pork marinated in Man Fu Yuan’s special housemade X.O. chilli sauce and livened up with sweetened strips of wintermelon and dried shrimps. For a sweet treat, try the red paste bean lye rice dumpling ($8) scented with fragrant orange peel. Cherry Garden at Mandarin Oriental Singapore presents three rice dumplings this season. Catering to the health-conscious is the new five-grain rice dumpling ($16), comprising brown rice, glutinous rice, black glutinous rice, sorghum and millet. A popular mainstay is the unique black garlic rice dumpling ($18) brimming with preserved vegetables, chunks of black garlic and Kurobuta pork. For something more classic, yet no less luxurious, share the Golden Pearl rice dumpling ($28) with hearty pork belly, abalone, chestnut, mushrooms and salted egg yolk. These savoury delicacies are available from June 8 to 18. Peach Blossoms celebrates the Dragon Boat Festival with a variety of rice dumplings till June 18. The new rice dumpling filled with abalone, sakura ebi and foie gras ($21.80) offers textural contrast with its combination of succulent abalone, velvety foie gras, and crunchy sakura ebi. Look out, too, for the traditional Hakka pork belly rice dumpling ($15.80) and classic Hong Kong-style rice dumpling ($28.80) filled with abalone, conpoy, pork belly, mushrooms, salted egg yolk, chestnut, lotus seeds and lentils. Health-conscious diners may choose between the multi-grain rice dumpling with abalone, conpoy and pork belly ($18.80) and the wholesome vegetarian multi-grain rice dumpling with cordyceps flower, black truffle and mushrooms ($11.80). Till June 18, Li Bai Cantonese Restaurant marks Dragon Boat Festival with a selection of three housemade rice dumplings. 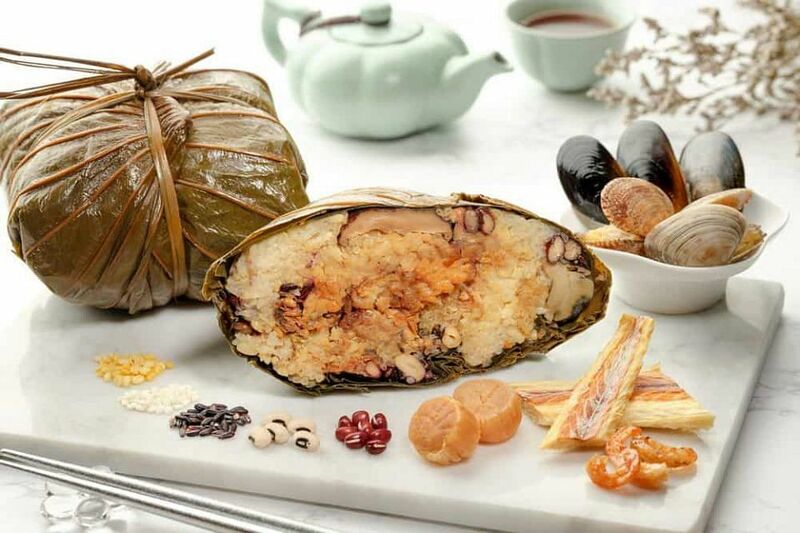 The new multi-grain and dried seafood rice dumpling ($48) is a lavish savoury parcel packed with an assortment of dried scallop, dried oyster, dried shrimp, sea whelk, sole fish, clam and mussel. Enjoy this wholesome dumpling bundled with healthy ingredients like black glutinous rice, red bean, mung bean and black-eyed pea. Back by popular demand, the abalone and pumpkin rice dumpling ($48) is a premium choice filled with abalone, pumpkin, chinese mushroom, pork belly, salted egg, mung bean, conpoy and chestnut. Another favourite is the traditional rice dumpling ($42) filled with pork belly, roast duck, Chinese mushroom, chestnut, salted egg, conpoy and dried shrimp. Each of the dumplings is housed in a red box, making it great as a gift. Resorts World Sentosa (RWS) brings back its signature Dumpling Festival Package, which consists of an assortment of five distinct dumplings filled with premium ingredients. A collaboration of five celebrity chef restaurants at RWS - Feng Shui Inn, Forest, Tangerine, Syun and Osia Steak and Seafood Grill - the dumplings bear the respective restaurant’s signature culinary style. This year, celebrity chef Sam Leong and his culinary team at Forest have created a flavourful X.O. Dumpling with Seafood. Glutinous rice is soaked in chicken stock and stir-fried with a housemade sweet-spicy X.O. sauce. Wrapped within the rice is a mixture of seafood including dried oyster, scallop and sea whelk. Meanwhile, Feng Shui Inn’s New Territories Village Traditional Rice Dumpling, teeming with a whole 10-head abalone from Australia, pork belly, fermented red beancurd paste, roast pork, black fungus and salted egg, is complemented with a housemade superior soya sauce. Meat lovers will enjoy Osia Steak and Seafood Grill’s Spiced Beef Cheek Dumpling. It is packed with tender Australian grass-fed beef cheeks slow-braised in a housemade five-spice concoction, complete with aromatic herbs and vegetables. Tangerine’s Organic Grains, Lotus Seed & Seaweed Dumpling features barley, brown rice and quinoa cooked in kombu stock and mixed with steamed lotus seeds. Rich in protein, fibre and minerals, this is a healthier alternative to the traditional meatier versions. Syun’s Japanese-inspired Unagi Dumpling presents a rich, umami-laden option – this version comprises Japanese mochi-gome, or sticky rice married with Japanese eel and shiitake mushrooms flavoured with teriyaki sauce and sansho pepper. Presented in a three-tiered bamboo steamer, which is also reusable and convenient for easy reheating, RWS’ Dumpling Festival Package ($98) is an ideal gift for family, friends or business associates. The set of five dumplings is available only for takeaway till June 15 (collection is until June 18 at Feng Shui Inn). Advance order of three working days is required. 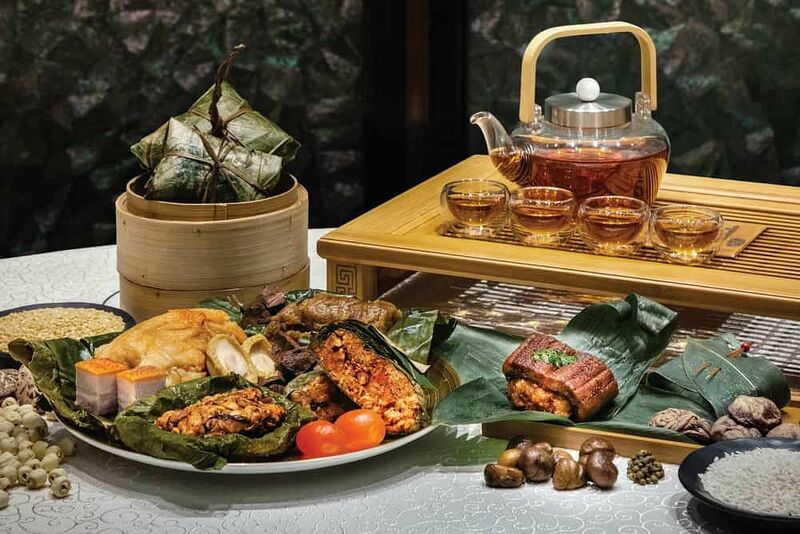 The one-Michelin starred Cantonese restaurant Summer Pavilion at Ritz-Carlton, Millenia Singapore is focusing on its traditional rice dumpling creation this year. 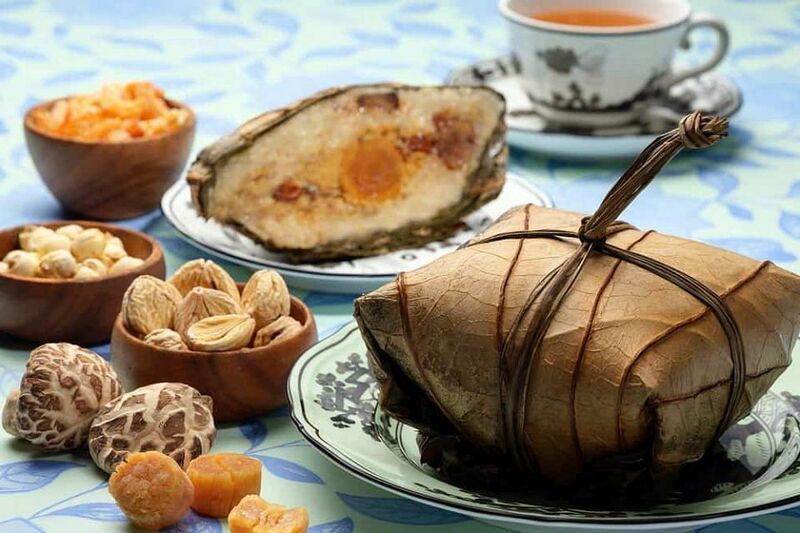 The decadent steamed glutinous rice parcel is filled with roast duck, roast pork, dried scallops, dried shrimp, salted egg yolk, mushrooms, lotus seeds, chestnuts and green beans. It is available at $22 a piece at Summer Pavilion till June 18. 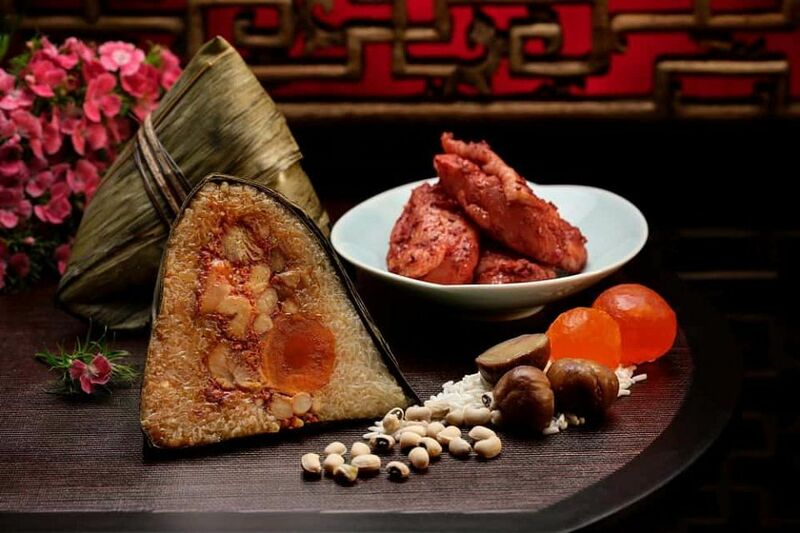 Paradise Group’s restaurants (Paradise Teochew, Taste Paradise and Canton Paradise) will be offering four variations of rice dumplings this year. The group is offering a new flavour of salted egg yolk, pork, and sakura ebi ($8.90). 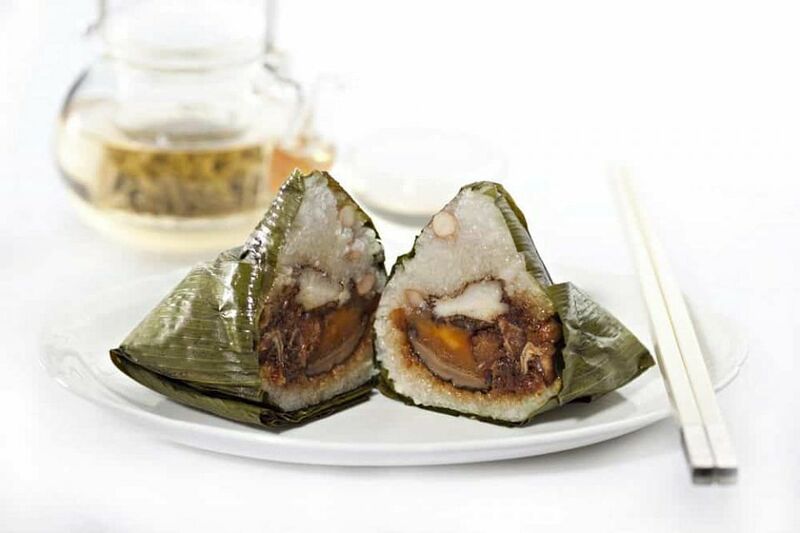 Wrapped within the glutinous rice is a combination of mung bean, pork belly, fatty pork meat, lotus seed, chestnut and dried shrimp. There is also the deluxe pork dumpling with conpoy and chestnut ($10.80), elevated with deep-fried shallot, five-spice powder, dried scallops and shiitake mushroom. 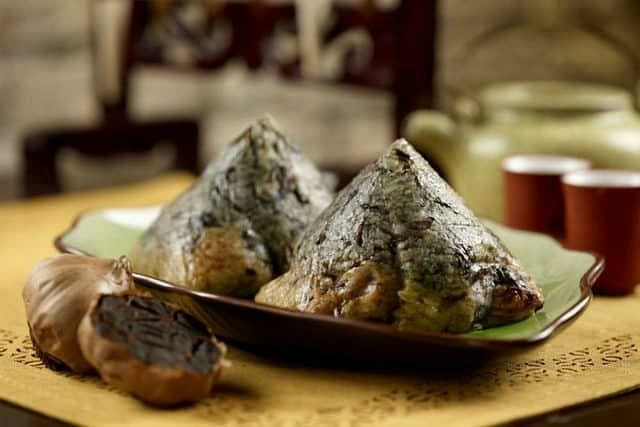 The luxurious square-shaped premium abalone dumpling ($23.80) contains a whole ten-head abalone bundled in soft glutinous rice. For the sweet-toothed, the lye dumpling with smooth red bean paste ($5.20), though not overly sweet, works as a dessert. To sample a bit of everything, get the four-piece package at $48.70.